"I hate this place. It's horrible." That seems to be the prevalent sentiment about Iraq from our fighting men and women. And most moviegoers. In The Hurt Locker, Jeremy Renner doesn't hate Iraq, at least because it allows him to do the one thing he loves most: get his kicks by defusing bombs. The Hurt Locker centers around the Marines' bomb technicians, who, in a country where everything is dangerous, have perhaps the most dangerous of all missions: to head towards the bombs left behind by Iraqi insurgents and shut them down while everyone else runs the opposite direction. Renner is part of Bravo Company along side squad sergeant Anthony Mackie and technician Brian Geraghty. They are all refreshingly real people, screwed up in different ways by the many months of their assignment in Iraq. Geraghty in particular is excellent in portraying his fear of dying in the desert as he watches his fellow soldiers die often senseless deaths. 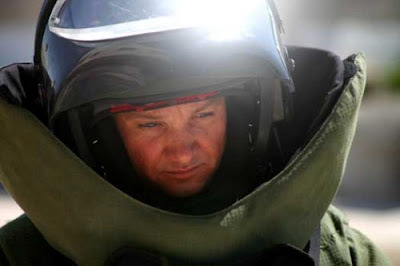 The Hurt Locker strives for gritty, shaky cam realism. This is a movie about defusing bombs were the bombs don't have red digital timers ticking down, if you can believe that. The characters, Renner especially, struggle against the macho action hero mentality movies and video games ingrain in American males. His attempts to go beyond their mission and attempt macho heroics end badly. Renner goes on a side mission to avenge what he believes is the murder of a young Iraqi boy he defended and this is the only sequence of The Hurt Locker that seems inauthentic. There's a bravura sequence where Bravo Company and a stranded squad are ambushed in the desert, where they have to resort to fighting with sniper tactics that's riveting. Ralph Fiennes, David Morse, Evangeline Lilly, and Guy Pearce also make brief but welcome appearances.